Title: 05/15/1997 - Clarification of the definition of a hazardous chemical and the requirements for Material Safety Data Sheets. Thank you for your March 6, letter to Ruth McCully, former Director of the Office of Health Compliance Assistance, requesting clarification of the definition of a hazardous chemical and the requirements for Material Safety Data Sheets (MSDS) in a physician's office. A hazardous chemical, as defined by the Hazard Communication Standard (HCS), is any chemical which can cause a physical or a health hazard. This determination is made by the chemical manufacturer, as described in 29 CFR 1910.1200(d). Attached is a copy of this section of this standard. Drugs are potentially hazardous chemicals, as defined by the HCS, therefore, manufacturers of pharmaceuticals must conduct a hazard evaluation for their products. If the pharmaceutical company determines that their product is a hazardous chemical, the downstream users, including physicians' offices, are required to maintain the MSDS. However medications which are in solid, final form for direct administration to the patient (tablets, capsules) are exempt from this requirement. 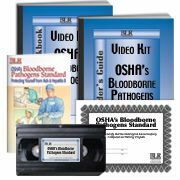 Satisfy OSHA Bloodborne Pathogen requiremenets with training, labels and more from Safety Emporium. Chemical manufacturers are not required to provide MSDSs for chemicals not covered under the HCS. OSHA realizes that manufacturers often provide MSDSs for reasons other than those of meeting the requirements of the HCS and that this can cause confusion to downstream users. OSHA has recommended, and continues to do so, that if a chemical is not covered by the rule, manufacturers provide a statement to that effect on the MSDS. In the absence of such a statement, employers should contact the manufacturer when they question the hazard status of a chemical. While the Physicians' Desk Reference (PDR) is an excellent resource, its intent is to describe the drug's effect on a patient and not to convey hazard information to employees. The HCS requires that employees have access to information regarding appropriate personal protective equipment, physical characteristics of the chemical, storage requirements, and other information as found in 29 CFR 1910.1200(g)(2). Not all of this is found in the PDR. Additionally, the HCS requires the manufacturer to address exposure to the hazardous chemical during foreseeable emergencies, such as leakage or spill from an injectable syringe. I hope that this information clarifies the requirements of the HCS for physicians' offices. If you have additional questions, please contact Wanda Bissel at (202) 219-8036 ext. 36. I am writing to you regarding a confusing issue for physician offices trying to be compliant with the OSHA regulations. The Hazard Communications Standards say that an MSDS must be available for any hazardous chemicals which are used in the practice. That is no problem. The problem comes when we start defining what hazardous chemicals are. There have been some recommendations in various articles recently which are saying that all liquid, aerosol, powder, or cream medications are considered hazardous and must have MSD Sheets. That can become very burdensome for physician offices, especially if that includes sample medications also. My question is whether an MSDS is necessary at all because every medication is listed in the Physicians' Desk Reference, which includes hazards related to that medication. Furthermore, if the staff do not come into direct contact with the medication, such as an injectable in a syringe, why would an MSDS be necessary. Keep employees informed with workplace safety guides from Safety Emporium. Initially, it was my understanding that certain drugs which are known for their caustic nature, such as chemotherapy drugs, would definitely qualify as a hazardous chemical and would need MSD Sheets. However, why would other medications need an MSDS? Please help us clarify this question. Thank you.